NBCUniversal and Charter Communications extended talks over a carriage deal Saturday while working to avoid a blackout that could cost millions of Charter subscribers access to NBC Universal's slate of channels, which include NBC network, MSNBC, Bravo, Telemundo and E!. "We will continue to negotiate in good faith so that Charter Spectrum customers can continue to receive NBCUniversal's valuable networks and we hope to be able to reach a deal," NBCUniversal said hours before the midnight deadline. Earlier this week, NBCUniversal warned Charter Spectrum cable customers of a potential blackout, which could threaten their ability to watch some marquee broadcasts. This weekend's edition of "Sunday Night Football" on NBC will feature a pivotal matchup between the Green Bay Packers and Detroit Lions. On January 8, the network will host the Golden Globes. "NBCUniversal values its partnership with Charter Spectrum, our third largest distributor," the company said in a statement earlier this week. "Charter Spectrum has been unyielding in its demand for terms superior to those agreed to by the rest of the industry, including larger distributors. Given this position, we feel the responsibility to inform viewers that Charter Spectrum may drop NBCUniversal's networks at the end of the year, including NBC, Telemundo, USA, Bravo and hit shows including the #1 show on TV—Sunday Night Football, WWE, the Golden Globes, This Is Us and more." The negotiations center around the fees that NBCUniversal and other content providers charge cable companies like Charter to show their channels. NBCUniversal has sought to ratchet up the public pressure with a marketing campaign aimed at Charter customers that was slated to launch Thursday. The campaign includes an onscreen crawl shown intermittently to Charter households, as well as a website -- Delivermyshows.com -- that encourages those customers to contact Charter. It's not unusual for such negotiations to go down to the wire, and even lead to blackouts. It's possible that NBCUniversal could opt against a blackout even if a negotiations go beyond the deadline. 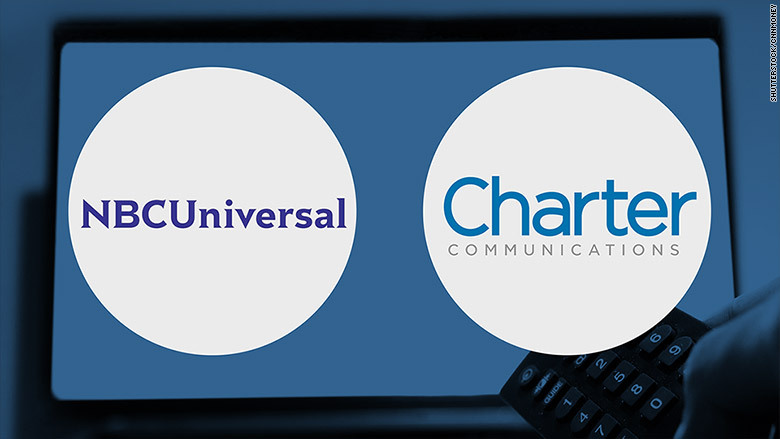 Charter has apparently been emboldened by its bombshell merger to seek more favorable terms from broadcasters, a posture that has seemed to continue in its negotiations with NBCUniversal. Variety, citing sources, reported that Charter "has rejected a package price for NBCU's channels similar to that paid by other distributors, and that negotiations have stalled completely."